One of my favorite fall vegetables is HANDS-DOWN the Butternut Squash. Just thinking about it makes me excited for Thanksgiving!! It is such a versatile vegetable – you can use it in warm or cold salads, as a delicious mash, instead of noodles, or even just chopped and roasted! Butternut squash is amazing with other super foods like quinoa, brussel sprouts, and cranberries – but its also fabulous all on its own! Roasted with a little olive oil, salt and pepper – so flavorful and rich – mmm mmm MMM! I love it! Okay okay – you get it, I know. So why am I writing all this jibber jabber? Because my FAVORITE form of butternut squash has yet to be mentioned! 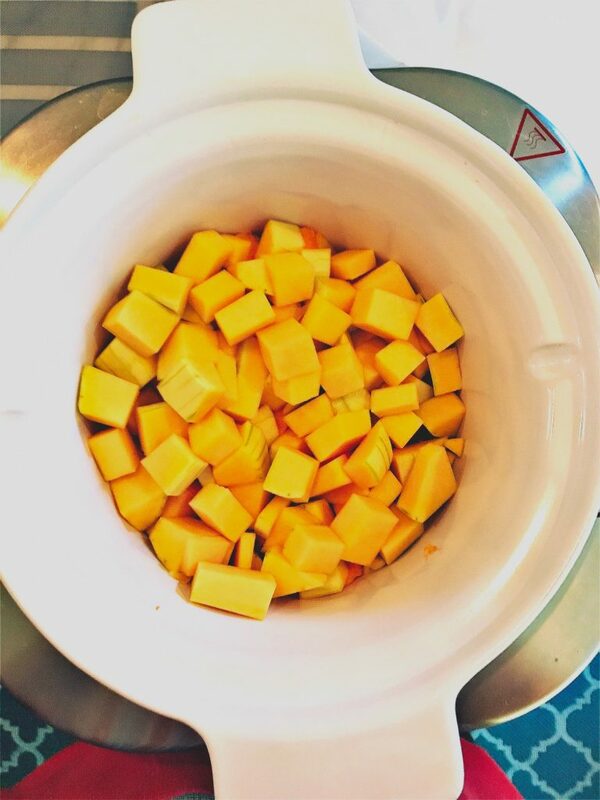 You guessed it ladies and gentleman – Crockpot Butternut Squash Soup! 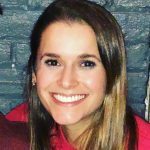 In two of my most recent posts, Crockpot Turkey, White Bean, Bacon Chili and The ULTIMATE Game Day Chili Roundup, I talked ALL about why I love soup this time of year. As the weather starts to get colder, there is nothing better than a nice, warm bowl of delicious soup to fill you up! I swear it just makes you feel good! Inside and out. 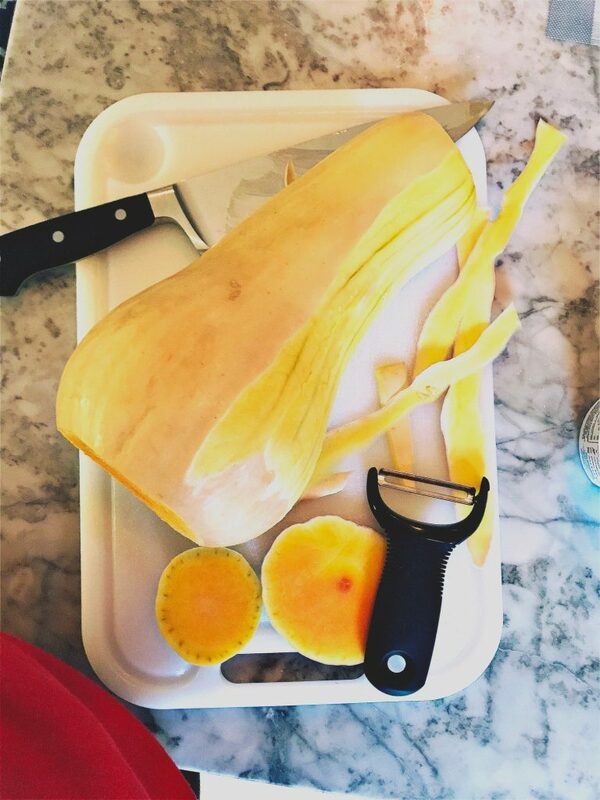 I am not going to lie – I actually didn’t know how easy it was to peel and cut a butternut squash! I would always buy the pre-cut butternut squash because I thought you had to cook and cut it like a spaghetti squash – what a cook I am, huh? But really, it’s easy! All you need is a sharp knife and peeler – I LOVE my OXO Good Grips Y Peeler . First, cut off the top and bottom of the squash so that the stem and base are removed. Then peel the entire skin off of the squash – careful because the squash can become slippery once the skin is removed (I suggest using a towel to hold it tight)! Cut the squash into quarters, remove all seeds – slice and dice the remaining squash! And there you have it! Now back to the butternut squash soup! 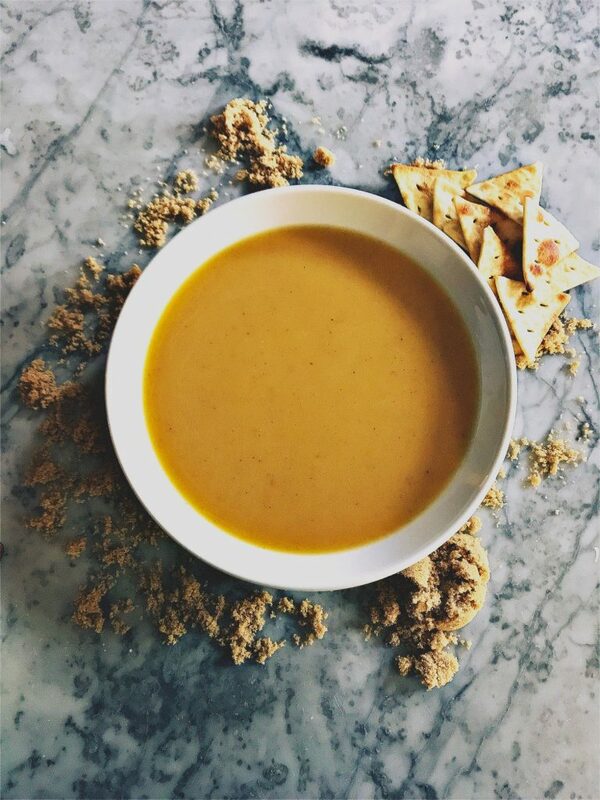 I love this vegan Crockpot Butternut Squash Soup recipe because it is light yet creamy and flavorful – the cinnamon, nutmeg, and cayenne pepper PERFECTLY compliment the butternut squash. But what sets this recipe apart? Three surprise ingredients – coconut milk, green apple, and brown sugar! Yes! I am talking about those delicious apples we picked last weekend at Lynd’s Fruit Farm! The coconut milk provides incredible depth in flavor and texture. 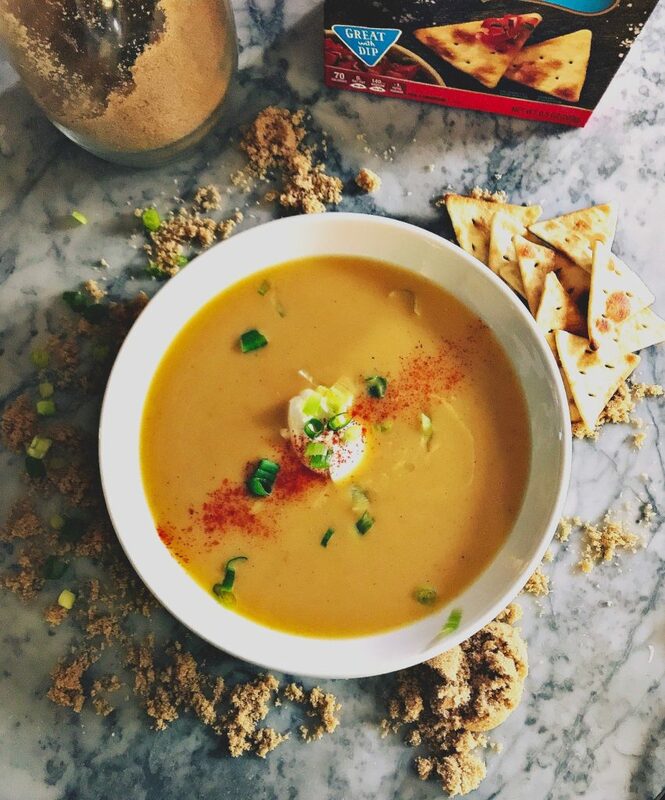 Making the soup creamy – and vegan! The apple provides brightness and acid that the soup, and your mouth, crave! And lastly, the brown sugar rounds out all the other flavors to make this soup go from pretty good to incredible! Depending on your personal taste – feel free to add more or less sugar for more or less sweetness! And of course, don’t forget to top with your favorite soup toppings! Sour cream, green onions, toasted pumpkin seeds, crackers, and/or a dash a cayenne pepper. 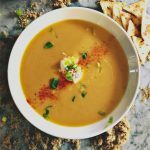 This is a fabulous soup to enjoy on Thanksgiving Day with the family – or any other day for that matter! Light yet creamy and flavorful, seasoned perfectly with cinnamon, nutmeg, and cayenne pepper - this Crockpot Butternut Squash soup is perfect for Thanksgiving! Coconut milk provides an incredible depth in flavor and texture. Making the soup creamy - and vegan! Green apple provides brightness and acid that the soup, and your mouth, crave! 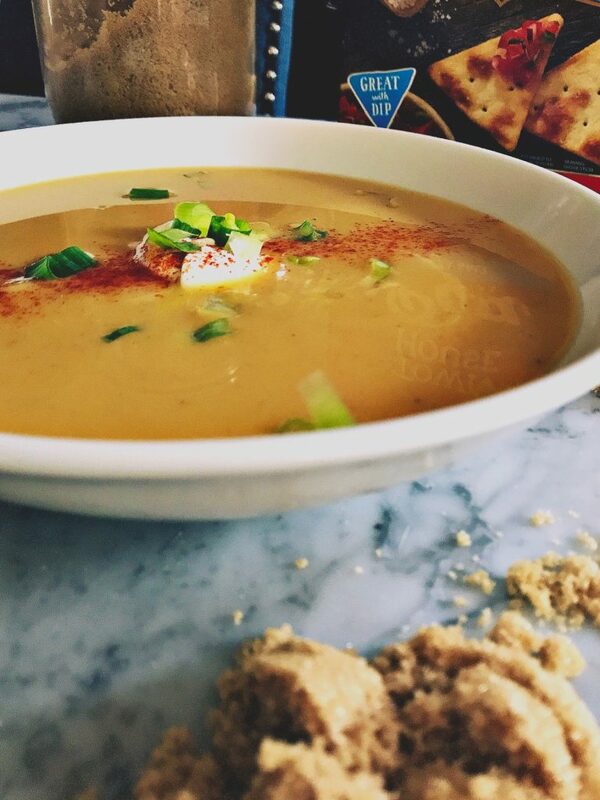 And lastly, brown sugar rounds out all the other flavors to make this soup go from pretty good to incredible! 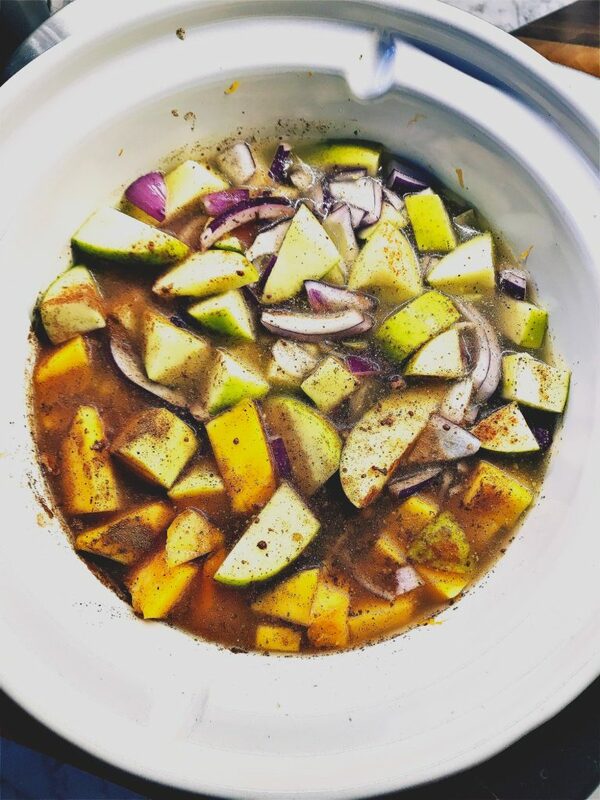 Peel and cut butternut squash then onion - add to crockpot. Rinse green apple, the chop and core (no need to peel). Place chopped pieces into crockpot. Add cinnamon, nutmeg, cayenne, salt and pepper to crockpot, then pour over all 32 ounces of vegetable broth. Cook on high for 2 1/2 hours or low for 6 hours. Test butternut squash for tenderness by using a fork to puncture. If butternut squash is tender (fork easily punctures), prepare to use the immersion blender. Be careful as the soup will be hot! (Feel free to let soup cool if that makes you more comfortable). Use the immersion blender to slow blend all solid chunks of butternut squash, onions, and apple until soup texture is smooth. Add brown sugar, coconut milk, and orange juice - stir to distribute. Cook on high for an additional 30 minutes, or on low for an additional hour - stirring occasionally. Serve soup hot with sour cream, green onions, crackers, or an additional sprinkle of cayenne pepper. Storage: Refrigerate in an airtight container for up to one week or freeze for 2-3 weeks.